New federal guidance could spur demand for guaranteed lifetime income products, which ideally can function similarly to pensions. It's a buyer's market for 401(k) fees, but plan sponsors won't benefit unless they're proactive. More 401(k) plan sponsors are tailoring TDFs to their participants' particular needs. Buck Consultants applies for a patent on the underlying process and technology of a new service. 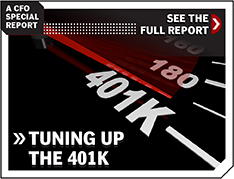 A number of emerging trends could help improve 401(k) plans next year. Companies want their employees to retire at a reasonably young age, like 65. The employees want the same. Increasingly, neither is getting their wish. The legions of baby boomers unprepared for retirement are driving many changes in the 401(k) space, including one that could make the unloved retirement vehicle look more like the cherished defined benefit pension plans of old: guaranteed lifetime retirement income options. A number of major insurers are offering the products, which provide plan participants who choose them a guaranteed income stream for life, à la pension plans. The first high-profile company to offer such an option within a 401(k) plan was United Technologies (UTC), in 2012. Few large plan sponsors followed suit, for a variety of reasons, and at companies that have done so, the participant take-up rate tends to be quite low. But the Treasury and Labor Departments handed out some much-needed guidance in late October that, together with future expected guidance, could provide a big shot in the arm for the lifetime income movement. At UTC, the lifetime income option is the default investment vehicle for new employees, who are automatically enrolled at a contribution rate of 6%, according to director of savings plans Kevin Hanney. (UTC froze its defined benefit plan to new employees in 2010.) An auto-escalation feature raises the rate to 10% by the time employees have completed about five years at the company, depending on their age. For all plan investments, not just the lifetime income option, UTC contributes 60% of the first 6% of employee contributions, on top of a 3.0% to 5.5% age-based payout that every employee gets, even if not enrolled in the 401(k) plan. Also unlike traditional annuities, if a retiree dies before the face value of the annuity is exhausted, beneficiaries can get a portion of the remainder as a death benefit. Despite such advantages, few large 401(k) sponsors have embraced lifetime income products. In a survey of 457 large and midsize U.S. employers released by Towers Watson in November, only 12% said they were offering such options. That was double the figure reported in a similar 2012 survey. However, the products are not applicable just to larger companies. In fact, Prudential alone has 7,000 plan-sponsor clients that offer its lifetime income solution. The firm won’t reveal the average participant take-up rate but says the aggregate investment value is $2.37 billion, or an average of about $34 million per company. 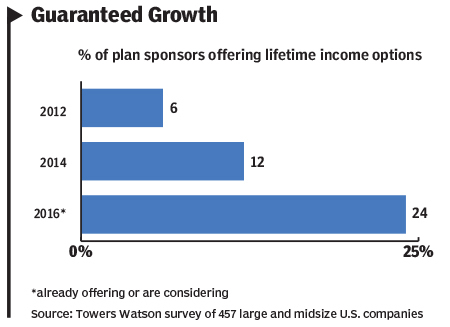 Why have lifetime income options been slow to catch on with large and midsize plan sponsors? Lack of employee demand is the chief reason, but probably the most-discussed reason is concern over the potential fiduciary liability involved in selecting a product provider (see chart). Until very recently, there has been little specific guidance from regulatory agencies on the matter, including whether there is a safe harbor available when making the selection. “For years, ERISA attorneys have been scaring employers about how complicated 401(k) fiduciary requirements are, all the things that could go wrong that could get them sued, and the last thing they want to do is add a complicated feature that nobody says they have to offer,” says Bill Charyk, a labor attorney himself and president of the Institutional Retirement Income Council. IRIC bills itself as an unbiased provider of information and education on the topic, though it’s funded by the insurance industry. “The lack of guidance on the fiduciary issues feeds into that paranoia,” Charyk notes. Another reason is that fund-management fees associated with the guaranteed lifetime retirement products are much higher — often 100 basis points higher — than those for other investments, because of the heightened risk to insurers. Moreover, it’s difficult to assess whether the fees are reasonable, says Caren Bianco, director of investments at PricewaterhouseCoopers. Indeed, in a 2012 New York Times article on the introduction of United Technologies’ plan, retirement researcher Anthony Webb was quoted as saying, “Given the information in the brochure, my Ph.D. in economics leaves me ill-equipped to say whether this is a good buy.” And unlike mutual funds and some other investments, there are no rating agencies that evaluate these products’ worthiness. In fact, such evaluations would be challenging to undertake, as there is minimal historical data available owing to the products’ relative newness, notes Marsh. A third reason for the products’ lukewarm reception is administrative complexities, including portability issues for plan sponsors that wish to switch to a different lifetime income provider or recordkeeper. “Those would be huge decisions that could create giant hurdles for plan sponsors,” said Lorie Latham, director of Towers Watson Investment Services. 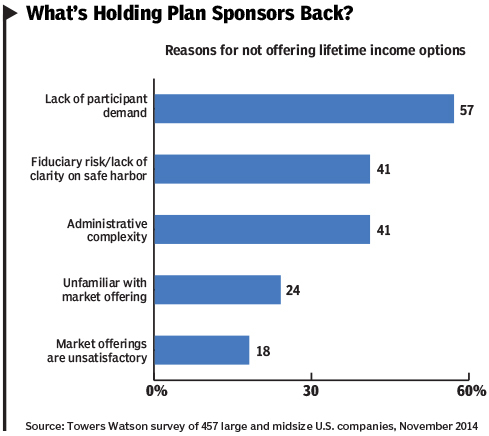 Plan participants have also been reluctant to embrace the lifetime income options when offered, for some of the same reasons plan sponsors have been, such as higher fees and portability issues. Additionally, there is a sticker-shock aspect to making the decision. “Someone may have $150,000 set aside, and it’s a huge amount relative to their current income,” explains Charyk of IRIC. “But when that’s translated into an income stream, the amount they’d be getting each month looks really little.” They feel like they’re giving something up, he says, although they’d usually do better in the end with the guaranteed income. The federal government has been trying for years to nudge companies in the direction of guaranteed retirement income within 401(k) plans. Now, finally, it’s putting some teeth into that effort by trying to calm fears over fiduciary liability. In October, the Treasury and Labor departments simultaneously issued guidance clarifying that sponsors can include deferred-income annuities in target-date funds used as a default investment. That’s an important clarification, as 86% of plans designate such funds as their Qualified Default Investment Alternative (QDIA), according to the Towers Watson research. The guidance also clarifies that if a plan sponsor exercises the required due diligence to select a target-date fund provider, it can turn over to that provider the fiduciary responsibility for selecting a lifetime income product. “You have no greater liability in selecting a provider that will include one of these annuity options in its target-date fund,” Salisbury says. At a minimum, it’s a step in the right direction. “No single event will cause a large number of plans to add income options,” says Fred Reish, an ERISA attorney with Drinker Biddle & Reath. “But this is just one among a series of actions.” For example, the Treasury Department has also issued guidance on guaranteed lifetime withdrawal benefits, which allow withdrawals from the invested account without having to annuitize the investment. Also, the DoL has indicated that it will be issuing additional guidance on a fiduciary safe harbor for selecting annuities. “The sum of these actions, together with the aging of baby boomers, will almost certainly mean that more plans will be adding insured retirement income,” Reish says. Progress is also being made on the portability issue. At least two companies, DST Retirement Solutions and SunGuard Financial Systems, have launched middleware that facilitates the use of providers’ retirement income products on other recordkeepers’ platforms. Of the 115,000 participants in United Technologies’401(k) plan, about 20% are invested in the “Lifetime Income Strategy” program. But that percentage is deceptively small, says Kevin Hanney, since former employees account for 40% of plan participants, and few were active when the lifetime income program was launched. Also, many participants still have access to funds accumulated in UTC’s frozen pension plan and may not need guaranteed income in the 401(k), says Hanney. Participants can allocate as much or as little to the program as they choose. The money that is allocated is invested according to a predetermined plan for altering the asset allocation as the employee ages. The Lifetime Income Strategy works something like a target-date fund in that monies are invested in equities and bonds until an employee reaches age 48. At that time the assets begin to be gradually transferred to a fixed-income fund (called “Secure Income”) through age 60, when 100% of the assets have been transferred. Employees who leave the company can keep their UTC retirement plan. If they contribute to an investment plan of a subsequent employer, they can roll those funds into the UTC plan when they leave that company’s employment. That means someone doesn’t have to be a UTC employee for decades in order to get the full value of the Lifetime Income Strategy program. At the same time, UTC’s plan assets grow, because the greater the volume, the better the pricing that can be negotiated for the plan. United Technologies has annuity contracts with three insurers — Prudential, Nationwide and Lincoln Financial. Alliance Bernstein, a retirement services provider, acts as a co-fiduciary in managing the investments and the underlying operational infrastructure.